Lionel Messi is embraced by Kylian Mbappe. 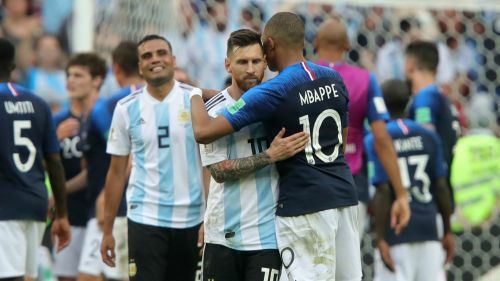 Messi's men had gone ahead through two goals either side of half-time, but a sublime Benjamin Pavard equaliser set the scene for Kylian Mbappe's heroics in France's eventual 4-3 victory. It was the only real scare Didier Deschamps' side would receive in Russia as they went on to overcome Uruguay, Belgium and Croatia to lift the trophy for the second time. "We got the best of Argentina… of Messi's Argentina," Lloris told Omnisport. "It made us realise we have the potential to go through. Every game was difficult, but we did really well. "We could feel a very strong team ready for the challenges ahead. We faced challenges after challenges following that game until the final victory. "Every game was difficult, but we did really well."